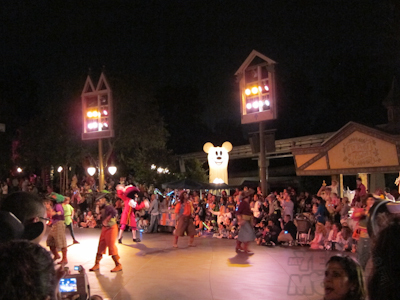 One of the fun aspects of Mickey’s Halloween Party is the parade. They really do try to give you extras to make the additional cost worth your money. 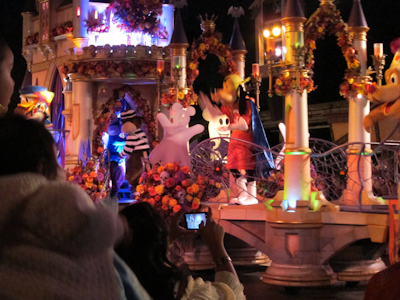 I absolutely loved the parade. This post is for those of you living vicariously through me. 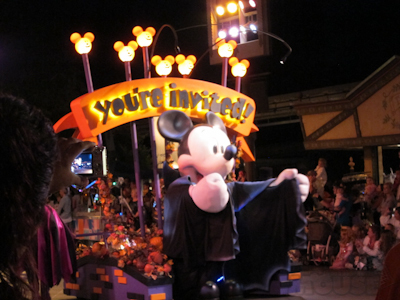 Vampire Mickey starts us off. 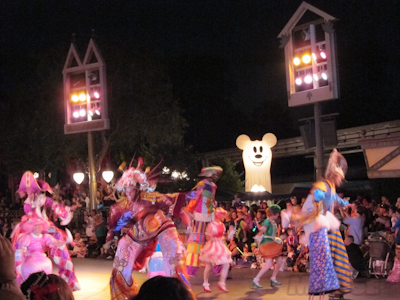 A Mummy, some striped-stockinged witches, and an oddly dressed woman come next. What is UP with that hair in the back? 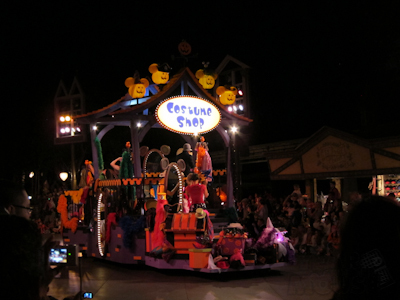 The Costume Shop float comes next. 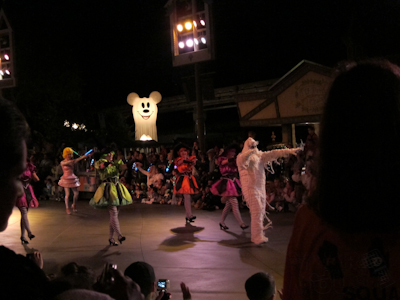 This has cast members pretending to try on costumes by adding various boas and hats and whatever while singing. No actual costumes are changed here. 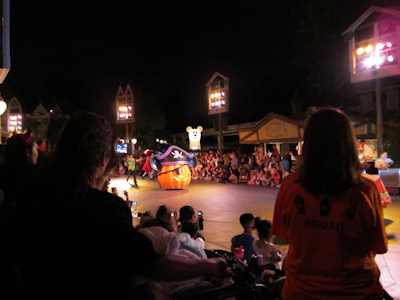 Peter Pan and Captain Hook were in that group too. 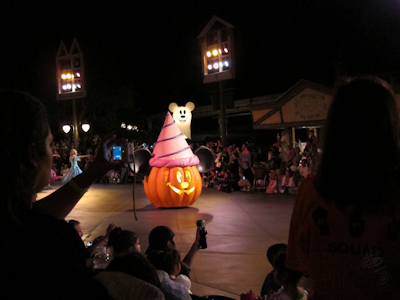 Next up is the pumpkin with the princess-y hat. 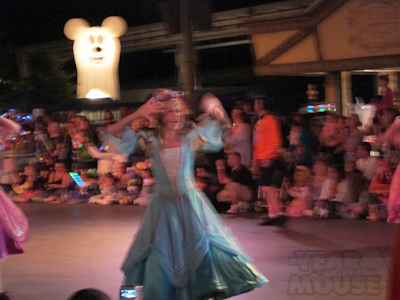 The princesses were all twirling and dancing so I had a hard time getting a picture of them. 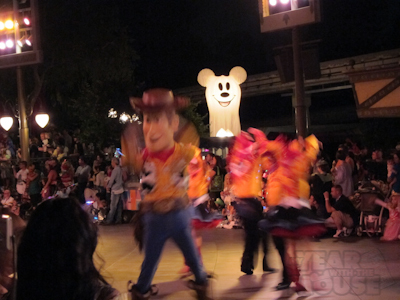 Woody! Much less fuzzy in person. 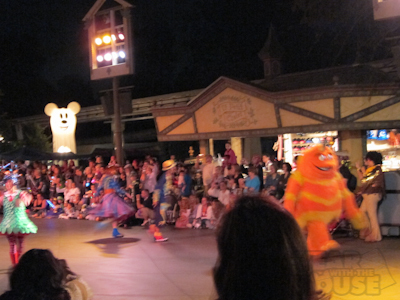 But it made a lot more sense when various monsters from Monsters, Inc. showed up. 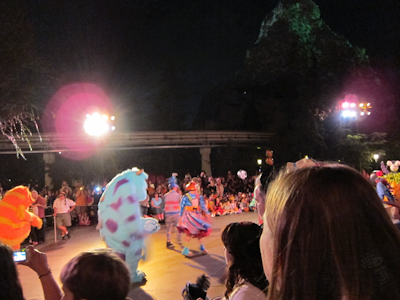 I did manage to catch Sully’s backside. 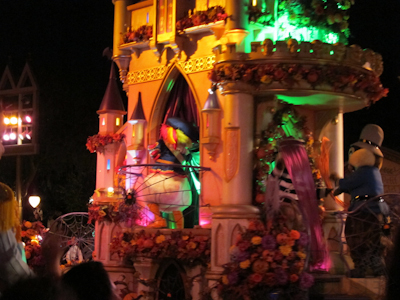 Then there’s a car with some characters from the Nightmare Before Christmas and also some honorary guests. 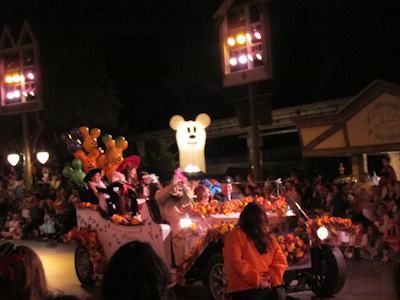 I’ve always wondered how you get chosen to be a guest who rides in a parade car. Boy, haven’t seen those faces around this park for a while! 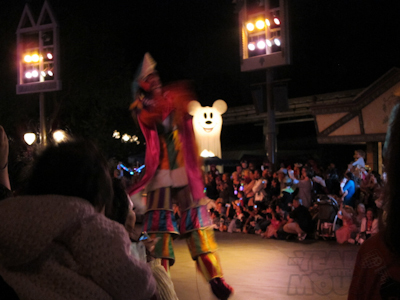 Next are very colorful people on very tall stilts. 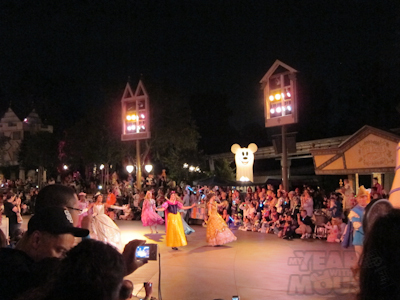 And then comes the final float! It’s pretty detailed so I took a couple pictures as it went by. With a talking Miss Piggy at the end! 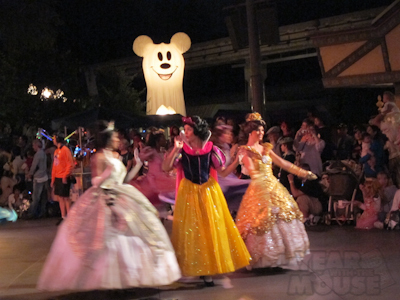 Thanks, I have been curious about the DL parade. 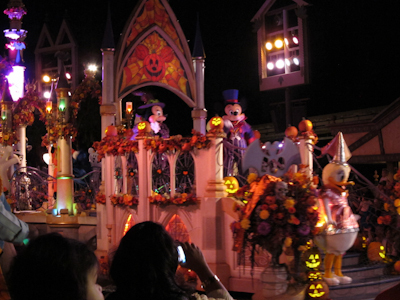 I saw the parade in the Orlando; “Mickey’s Not-So-Scary Halloween Party” a few years ago and I wondered about any differences. 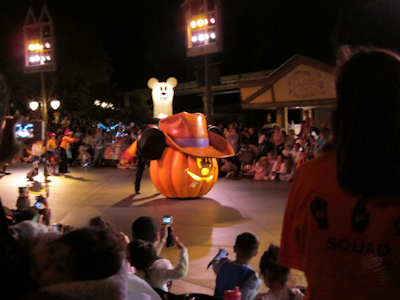 Did they play the “Boo To you” Music during the parade? 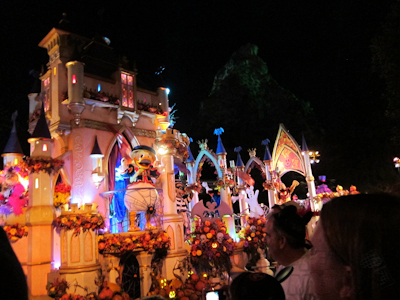 In Florida there was a group of coordinated, dancing, singing grave diggers ( a grave digger drill team, as it were, complete with spades) and a host of characters from the Haunted Mansion, including a float with the hitchhiking ghosts, as well as the shivering groundskeeper who was walking a real bloodhound, and a large number of Disney villains in costume. I don’t recall if they were on floats or walking the route. 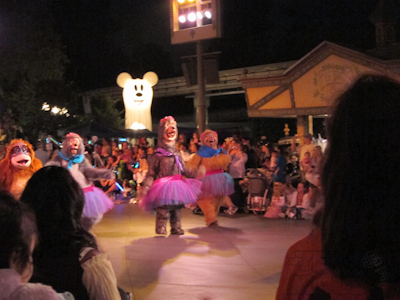 I guess each park is responsible for putting on its own parade. No, it was nothing like that. 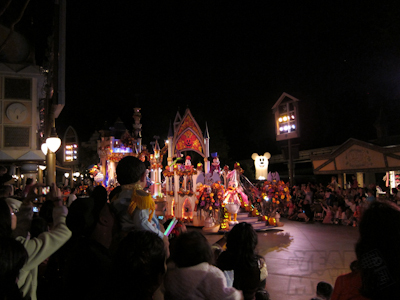 It was a very small, fun parade but not elaborate at all. 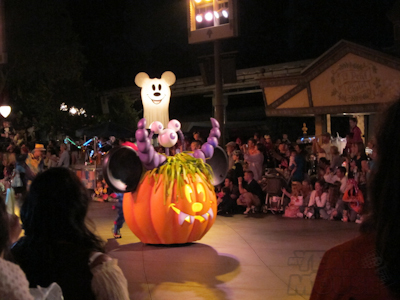 I wonder if it’s because it’s only for the Halloween Party and since that doesn’t happen every night or even close to every night, they just kept the production simple. Looks like a nice parade. Hope the fireworks were as good.